How old is humanity? If this is a question that makes you fantasize on the mysteries and marvels of humankind then your next Johannesburg sightseeing adventure should be the Sterkfontein Caves (a World Heritage Site since 2000). You can also combine this trip with a visit to Maropeng for a very cultural and informative day outside the city of Johannesburg. One of Johannesburg’s oldest and most valuable attractions, Sterkfontein is a set of limestone caves located in the Gauteng province, 50 kilometres north-west of Johannesburg. This place was one of the best environments for the preservation of ancient skeletons and for fossil formation, due to the heavy limestone deposits. The scientists from the University of Witwatersrand have been excavating the Sterkfontein area for many years and the precious discoveries they have made show interesting facts about the creatures that populated the Earth before the modern humans. Back in 1947, Dr. Robert Broom from the University of Witwatersrand discovered the nearly complete skull of a supposedly adult female nicknamed Mrs. Ples, followed by the discovery of thousands of other fossils at Sterkfontein and the surrounding area. More recently, in 1997, an almost complete hominine skeleton was discovered in these sites. It is supposed to be about 3.5 million years old and it was named ‘Little Foot’. The skeleton is partly covered in breccia (a cemented rock) and it is just partially exposed to visitors. So, if you enjoy seeing old things, these are as old as you are ever going to get! The Sterkfontein Visitor Centre lies on a beautiful, unspoilt grassland. The unique hominine exhibition offers displays that are rich in information, an auditorium with 128 seats, a souvenir shop and a restaurant with a charming view of the countryside. You can also watch the excavations and the working laboratory where scientists observe the latest fossil finds before your eyes. If you feel you want a more detailed experience, take a guided tour of the caves and descend 60 metres below the ground. Palaeoanthropology will never seem as fascinating as on this adventure! When you feel you have gained enough knowledge for the day, you can relax wandering around the craft shops, visiting farms or having a meal in one of the restaurants in the area. A hot balloon ride could also be a great choice, together with a visit to Magaliesburg or a hike in the Magaliesberg Mountains. For this day out, you definitely need to wear comfortable shoes and travel without large bags. The deep caves have narrow paths so the bulky items would just be in the way. 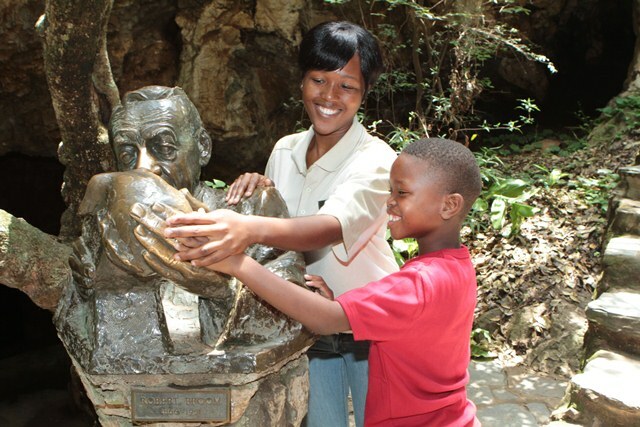 The Sterkfontein Caves tour is open every day, and is not suitable for people with asthma or claustrophobia. Don’t miss this intense experience and take your family for a visit to the Sterkfontein Caves, the most important hominid fossil site in the world! Together with Maropeng, these Johannesburg attractions provide the perfect lesson on the beginnings of humanity to be learnt and remembered. Stuck in a hole with no cheap flights in sight? Book JNB air tickets with us and save!